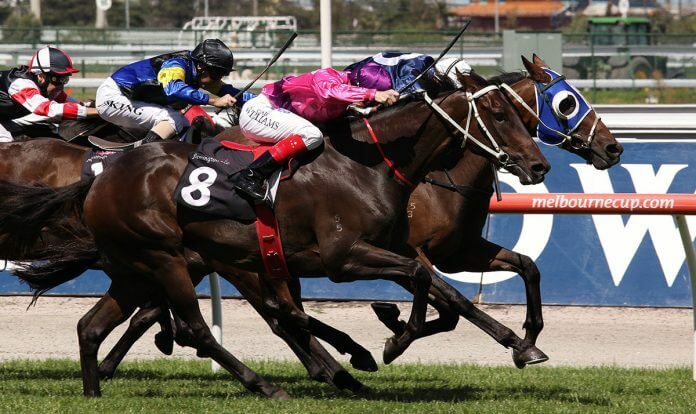 Our Melbourne pro runs his eye over the main event at Caulfield. The rail is out eight metres for the first time in three-and-a-half-years. I’ll walk it today but I expect it’ll play fairly standard and suit those on-pace. Faatinah from inside will push through to lead, with Rocket Tommy and Crystal Dreamer coming across from wider. Legless Veuve and Sunday Escape will be handy. Kaepernick and Well Sprung could be placed a bit awkwardly inside in midfield, and Mahuta will be caught wide. Rageese and O’Malley go back. Mahuta (Weir / B Rawiller): first up here, but he’s a pretty consistent operator and should be able to run to his best. Faatinah (Hayes & Dabernig / Allen): ran second in Oakleigh Plate over this course and can run to that here, so can’t be discounted. Kaepernick (Hawkes / Dunn): ran okay in the Group 1 and generally gets home pretty hard. Just has an awkward draw here on the inside. Rageese (Weir / Nolen): was terrific in the Chatham Stakes on Oaks Day, but is off a spell here and and I think will need a run or two. Gets back. Crystal Dreamer (Ellerton & Zahra / Lane): is unbeaten in three runs second-up and is second-up here. Looked good off the spell too, and will roll forward here. Well Sprung (Tolson & Proctor / Moloney): another one with an awkward draw in midfield on the fence, though he did run on really well against the bias at Mornington. Malibu Style (Parnham / Parnham): was good here first-up a couple of weeks ago and should be able to re-produce that. O’Malley (Jusufovic / McNeil): will get back here, and best form is over a shorter distance. Legless Veuve (Webb / Thompson): has had a freshen up, getting seven weeks off. Will race handy and is a very honest campaigner. Rocket Tommy (Johnstone / Fry): has won last three starts and looked really good, so I can’t see why that can’t be reproduced here. Sunday Escape (Murray / Newitt): hasn’t won for 20 months and his best form is over 1000m. I’m happy to risk him. Orujo (Mathrick / Baster): ran well first but was quite plain over the last couple and overraced last start. I’ll oppose. A wide open affair here, but I’m with Crystal Dreamer who should be at a pretty good price.